From Mexico, New York, Leeds to Berlin, we have a host of handsome fellas in the midweek roundup. Daniel Craig: The actor joined his glamorous co-stars for the ‘Spectre’ Mexico City premiere on Tuesday (November 2) wearing a Thom Sweeney suit. While I prefer Daniel in darker hues, I love how the pale-blue tie enhances his steely gaze. Liam Hemsworth: For the start of the ‘The Hunger Games: Mockingjay – Part 2’ promo tour, Liam wore a blue windowpane Ermenegildo Zegna three-piece suit with a burgundy polka dot tie and co-ordinated shoes adding some flare. Jared Leto: The actor joined the Jolie-Pitts for the WSJ. Magazine 2015 Innovator Awards last night (November 4). I love that even when toning things down, Jared’s Saint Laurent Spring 2016 look still possess plenty of flare. 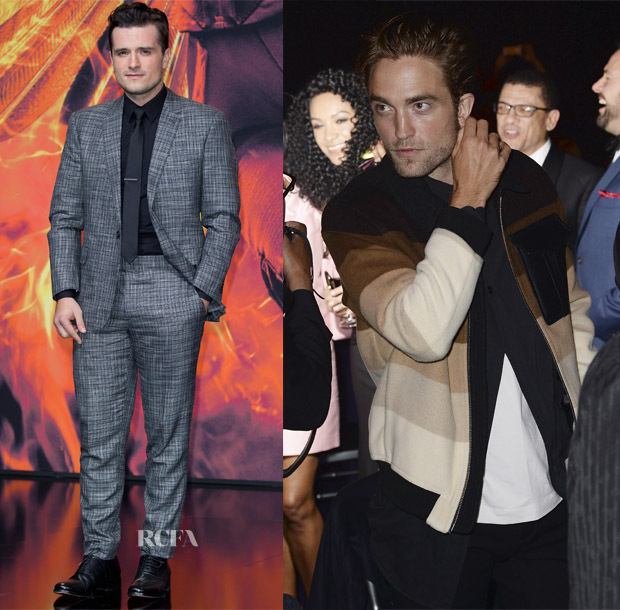 Josh Hutcherson: The actor looked very sharp in his grey suit with black shirt and tie combo. Robert Pattinson: The actor who is known for his love for Gucci and Dior Homme, stepped out in a J. W Anderson striped bomber jacket while supporting his girlfriend FKA Twigs at the MOBO Awards.